This year's NFC and AFC Championship games were billed as the attacking match-ups of the decade ahead of a supposed end-to-end high-scoring Super Bowl. For the first time ever, the NFL's top-four scoring offenses reached the final four spots in the playoffs. The Kansas City Chiefs, Los Angeles Rams, New Orleans Saints and New England Patriots all scored, on average, over 27 points per game during the regular season. In fact, not only were the top teams scoring freely, but league-wide the 2018/19 season will go down as one of the most prolific attacking years in history. Teams across the league scored 1,371 total touchdowns - the most in a single season in NFL history - and 11,952 points - second-most of all time behind 2013. Los Angeles were one of three teams (Chiefs, Saints) to average at least 30 points per game, making this only the fourth season ever with three teams scoring at least that much. All in all, it was clearly a special offensive year. While the Wild Card Round scores were subdued, the eventual Super Bowl opponents, New England and Los Angeles, scored 78 and 56 points in the two games heading into Atlanta, respectively. New England secured their sixth Lombardi Trophy with a stunning defensive performance in their 13-3 win, holding the Rams to just three points, and forced nine punts from Johnny Hekker. Both teams combined to convert just six of 35 third-down attempts in a cagey, anti-climactic ending to a crazy season. After such a great year for NFL attacks, what happened? You win a game by out-scoring your opponent. That’s obvious. But also obvious is that shutting them down, or coming up with a game-changing play, can make the difference. On Sunday, the defensive dominance by the Patriots was clear. The Rams offense, for the most part, had been unstoppable throughout Sean McVay's first two years in charge. His team were shut out in the first half for the first time in 36 games, and finished with their lowest point total. But the Rams’ performance on D should be applauded too. On any other day, holding Tom Brady to only 253 yards, no touchdowns and one pick would work out well. The game ultimately came down to huge moments and plays by New England’s defense. Jason McCourty’s key play, where he ran - according to the NFL’s Next Gen Stats - over 19 yards across the field after the ball was released to knock down a Jared Goff pass intended for Brandin Cooks, helped his team hold the Rams to three points. With four minutes to go, Stephon Gilmore came down with the crucial interception as the Rams were driving to tie the game, and New England followed it up by extending their lead to 10 points with a Stephen Gostkowski field goal. Brandon Graham’s strip-sack of Brady last year will go down in Philadelphia sports history, despite the fact they couldn’t slow the quarterback down almost all game. So will Dont’a Hightower’s forced fumble on Matt Ryan during New England’s famous 25-point comeback in Super Bowl LI. Offense may get you there, but game-altering defensive plays in a Championship game are essential. How did the Patriots do it? In the build-up to Super Bowl LIII, New England’s coaches - and the rest of the NFL world - heard all about McVay’s brilliance. We even published a 2,000-word piece on the 33-year-old, who was aiming to make history and become the youngest head coach to win a Super Bowl. With two straight top-two offenses, he was an attacking mastermind who couldn’t be stopped. Widely discussed in the build-up was McVay’s use of the microphone in Goff’s helmet. A head coach can talk to his QB until there are 15 seconds left on the play clock, and McVay would have his team line up early to communicate what he was seeing to Goff. However, according to Albert Breer of the Monday Morning Quarterback, the Patriots found their answer for McVay’s offense by taking the coach out of the equation. Breer said: “They essentially sent in two calls on every play. One was what they’d show before the snap. The other was what they’d switch into post-snap.” In other words, whatever McVay thought he was seeing and subsequently relayed to Goff meant bupkis. Ultimately, the decision-making was left in the QB’s hands, and it is simply not something he is used to. A New England team also predominantly known to play man coverage decided to mix it up and use extensive zone. 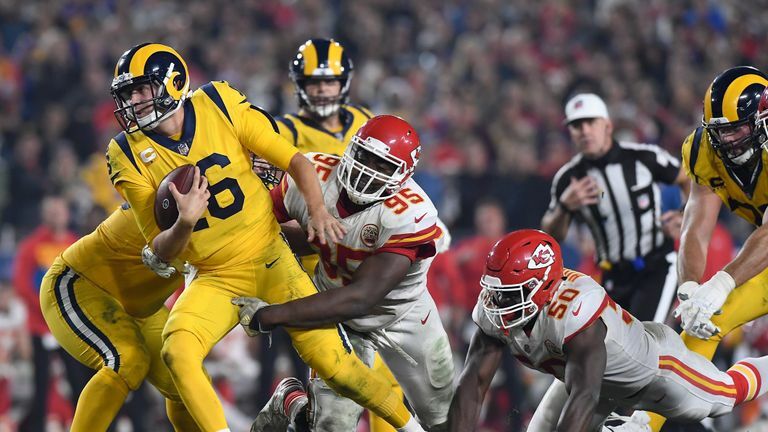 They caused confusion and chaos all game, and Goff was flustered, finishing the game 19 of 38 for 229 yards, with no scores and that late interception. Additionally, he was sacked four times. Once again, the Patriots proved they don’t have one single ‘identity’. While many teams struggle to adapt, the six-time champions thrive at it. Before Sunday, NFL teams had already made clear their intention to hire the next bright, up-and-coming offensive minds. Rams quarterback coach Zac Taylor was confirmed as the new head coach in Cincinnati on Monday. Last year’s Rams offensive coordinator, Matt LaFleur, has already bagged the position in Green Bay. And the list of QB guru hires in recent years goes on: Kliff Kingsbury and Freddie Kitchens will be in charge for the first time this season, while veteran Bruce Arians and previous Miami coach Adam Gase got new gigs to help develop their young signal-callers. However, some teams have zigged where others zagged. Miami’s hire of Flores was perhaps a statement: we need to be able to slow down the high-scoring attacks around the league, and particularly that of the division-rival Patriots. In Denver, the Broncos poached Vic Fangio from the league’s best point-scoring defense: Chicago. The AP Assistant Coach of the Year was one of the few men who could slow down McVay’s Rams during the season, holding them to just six points in the Windy City in December. The NFL is a copycat league. The wildcat, the read-option, and no-huddle offenses have all had their 15 minutes of being the most talked-about trends around the league, and in recent years, it is the high-flying attacks led by QB gurus. One way to win is get ahead of the curve, the way the Patriots have done for 20 years. Will we see the NFL shift back towards the defense?